Case details: Wyman was convicted after a jury trial. He worked as a clerk in the prison office. His sentence was affirmed by state supreme court, 56 Mont. 600, 186 Pac. 1 (1919) #4379. Despite several appeals, including by the sentencing judge, and ample evidence of political payback, Gov. Stewart refused to commute Wyman's sentence, saying he would never commute a sedition sentence. However, Gov. Dixon did commute Wyman's sentence to 5-12 years (making Wyman eligible for parole) on May 21, 1921. Wyman served 32 months, and was released on July 5, 1921. 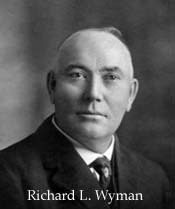 Wyman had presented ample evidence of a frame-up by his political enemies, particularly two members of the board of county commissioners, whom he had accused of stealing from the county (and who were ordered by a court to pay back more than $9,000). Wyman presented evidence that his enemies used a clerk in his office to gather evidence against him. As a member of the Exemption Board, Wyman had refused to exempt the woman's brother from the draft, rejecting false evidence that he was farming, thus angering the clerk. Personal Information: Born in Levant, Maine. Lost his left hand and forearm in a gun accident; had a wooden hand. Came to Montana about 1895, working as a sheep shearer and schoolteacher. Was a Sidney delegate to 1896 Republican county convention. Married Cecilia Obergfell and had two children. Served 18 years as elected county clerk and recorder in Dawson County and also owned the Lyric Theater in Glendive. After his release from prison, he and his family moved to Coeur d'Alene, Idaho, where he pumped gas and sold shoes door-to-door for a living. Died April 5, 1928, in Coeur d'Alene and is buried there. Living relatives in Idaho and Montana.